Ridgeway Brewing (UK) is known for its Christmas beers. 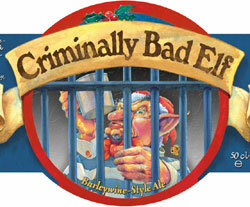 Criminally Bad Elf is their Christmas Barley Wine offering. The bottle I drank was aged for one year at the brewery and then an additional year in the bottle in my beer cellar. Having tasted Ridgeway’s fresh Barley Wine, I was readying myself for a full frontal hop assault. I was deliciously mistaken. It pours cloudy goldenrod from the bottle, building a thin, dense head that dissipates quickly, leaving very little lacing. The aroma is of sweet barley malt with a hint of hop. The first sip is fruity but marked with hops; a typical barley wine taste. The mid taste builds on the fruitiness while continuing the hop bitterness. The mouthfeel is akin to that of grapefruit juice. The rear taste brings on the hop assault and the alcohol (10.5% – low for a barley wine) begins to lend a boozy note to the flavor. The aftertaste is where the additional year in the cellar really shows: Instead of finishing like an IPA, it finishes like a white wine. The hops suddenly back off on the bitterness and settle down into a very pleasant aroma. The malt sweetness gets cranked to 11 and the whole thing just wraps up nicely into something that I wish I could get from other barley wines. I highly recommend this beer for people who like the flavor of an IPA without the bitterness, people who like white wine and want to try a good, full-flavored beer, or big fans of barley wine. I also recommend extended aging if you can. It really changes the overall character of the beer into a more mature, developed brew. This entry was posted on December 6, 2010, 7:26 PM and is filed under Alcohol, Food. You can follow any responses to this entry through RSS 2.0. You can leave a response, or trackback from your own site.